MUNICH (AP) — The 18-year-old gunman who opened fire at a crowded Munich shopping mall and fast-food restaurant, killing nine people and wounding more than two dozen others before killing himself, was obsessed with mass shootings, German authorities said Saturday. Investigators searched the German-Iranian man's home overnight and found a considerable amount of literature about mass killings, including a book on school shooters, but no evidence that he was linked to extremists such as the Islamic State group. They believe he acted alone. They also say the attack wasn't linked in any way to the recent influx of asylum-seekers that has stirred a debate about immigration in Germany. All those killed were Munich residents, including seven teenagers, and the shooter was born in Germany, authorities said. Interior Minister Thomas de Maiziere said other information showed that the shooter, whom he identified only as David, had researched a 2009 school shooting in Germany, and the bomb-and-gun attacks in Norway by Anders Behring Breivik, who killed 77 people exactly five years ago Friday. "There was material found in the apartment of the suspect that showed a particular interest in shooting sprees, (but) there is so far no indication of any connection to international terrorism," de Maiziere said at a news conference Saturday. Authorities are still trying to determine a motive, and de Maiziere said they were investigating reports that the shooter had been bullied by his peers. German Chancellor Angela Merkel called a special meeting of her government's security Cabinet on Saturday. After the meeting, she pledged that Germany would "do everything possible to protect the security and freedom of all people," saying that in the wake of an attack earlier in the week near Wuerzburg and the deadly attack in Nice, she understood Germans are wondering "where is safe?" Initial investigations suggest the Munich-born suspect had been treated for psychological problem, but details were still being confirmed, said Munich prosecutor Thomas Steinkraus-Koch. Authorities have not been able to talk with the parents of the shooter. De Maiziere said they were asylum-seekers from Iran who came to Germany in the late 1990s. Robert Heimberger, the head of Bavaria's criminal police, said it appeared the shooter had hacked a Facebook account and sent a message inviting people to come to the mall for a free giveaway. The posting, sent from a young woman's account, urged people to come to the mall at 4 p.m., saying: "I'll give you something if you want, but not too expensive." "It appears it was prepared by the suspect and then sent out," Heimberger said. The woman shortly after reported that her account had been hacked. The attack in the Bavarian capital sparked a massive security operation as authorities — already on edge after the recent attacks in Wuerzburg and Nice — received witness reports of multiple shooters carrying rifles shortly before 6 p.m. (1600 GMT). Eight hours later police declared a "cautious all clear," saying the suspect was among the 10 dead and had likely acted alone. Police on Saturday searched an address on Munich's Dachauer Strasse where the shooter lived, and a neighbor described the suspect as "very quiet." "He only ever said 'hi.' His whole body language was of somebody who was very shy," said Stephan, a coffee shop owner who would only give his first name. Some 2,300 police from across Germany and neighboring Austria were scrambled in response to the attack, which happened less than a week after a 17-year-old Afghan asylum-seeker wounded five people in an ax-and-knife rampage that started on a train near the Bavarian city of Wuerzburg. The Islamic State group claimed responsibility for the train attack, but authorities have said the attacker — who was shot and killed by police — likely acted alone. The Munich suspect's body was found about 2 1/2 hours after the attack, which started shortly before 6 p.m. at a McDonald's restaurant across the street from the mall. He was found with a 9mm Glock pistol and at least 300 rounds of ammunition, police said. A cellphone video posted online showed the person filming from a balcony engaging verbally with the suspect, who was dressed in black on the rooftop of the mall parking structure. The shooter at one point yells, "I'm German," to which the filmer responds, "You are a jerk," and demands to know what's going on. The shooter yells at him to stop filming, and shortly after opens fire. Munich's police chief, Hubertus Andrae, said police believe the video is genuine. Police have asked anyone with video and photos of the attack to upload them directly to their website to aid the investigation. David Akhavan, a 37-year-old from Tehran, Iran, who works at the Shandiz Persian restaurant, described his anguish as he learned of the shooting. "I started to get texts from friends asking if I was safe," he said. "Then, my thoughts were 'Please, don't be a Muslim. Please don't be Middle Eastern. Please don't be Afghan.' I don't accept any of this violence." Witnesses had reported seeing three men with firearms near the Olympic Shopping Center mall, but Andrae said two other people who fled the area were investigated but had "nothing to do with the incident." Residents described the scene as the shooting unfolded. "I was standing on the balcony smoking a cigarette. Suddenly I heard shots," said Ferdinand Bozorgzad, who lives in a high-rise building next to mall. "First I thought someone had thrown some firecrackers. I looked down at the McDonald(asterisk)s and saw someone shooting into the crowd. Then I saw two people lying there. " Franco Augustini, another resident, said his daughter hid in the shopping center during the attack. "Next to our flat was a woman who was full of blood," Augustini said. "My wife had a bottle of water. Then we helped to wash her. It was horrible and made me speechless." Andrae, the police chief, said seven of the victims were teenagers; a 20-year-old man and a 45-year-old woman were also killed. All were residents of Munich, he said. Twenty-seven people were hospitalized, including four with gunshot wounds, he said. 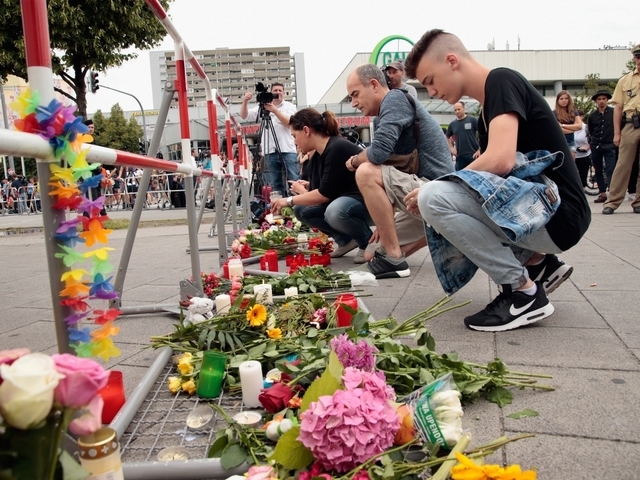 Munich's mayor, Dieter Reiter, declared a day of mourning for the victims of "this terrible act." "These are difficult hours for Munich," he said, adding that the city's citizens had shown great solidarity toward each other. "Our city stands united."